Canadian biographer Justin C. Vovk rightly credits biographer Julia Gelardi for providing the inspiration and format that led to the publication of his first book, In Destiny's Hand (IUniverse:$25.95). Julia's most recent book is From Splendor to Revolution. Vovk's book follows this format, which chronicles the lives of five of Empress Maria Theresa's children, all of whom became sovereigns or consorts, through the single narrative. Empress Maria Theresa and her husband, Franz, were the parents of sixteen children. Two of their sons, Joseph II and Leopold II, were Emperors of Austria. Amalia, Maria Carolina and Maria Antonia were the consorts of foreign sovereigns. Maria Theresa was a mother determined to secure powerful marriages for her children, thus increasing Austria's influence in Europe. This did not always work, especially in France, where being a Austrian archduchess did not do Maria Antonia any favors. The lives of these five children were not easy. Joseph II nearly brought civil war to Austria while his successor, his younger brother, Leopold II, brought calm to his reign, although his early death put a damper on Austria's power. Maria Amalia became the wife of the Duke of Parma. Maria Carolina married the King of the Two Sicilies. The youngest sister, Maria Antonia, made the most glittering of marriages, when she wed the future King Louis XVI. Maria Antonia, better known as Marie Antoinette, was the most famous of Maria Theresa's children, largely due to the French revolution and the regicide that followed. This is Vovk's first book, and he should be commended for taking on such a challenge. 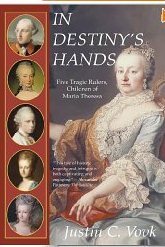 In Destiny's Hand is a largely competent historical work, as the author makes use of myriad of primary and secondary sources, biographies, histories, family correspondence. Maria Theresa was an inveterate letter writer, especially to her daughters. Private correspondence was how the Empress kept in touch with her children. Vovk tries very hard to provide a balanced account of the lives of the five children. This is not an easy task as the narrative, at times, can be confusing. There were times I needed a scorecard to keep track of the marriages between cousins and the family machinations. Louis XIV and Marie Antoinette were executed by the revolutionaries, and Marie Antoinette's sisters never forgave the French for her death. Amalia and Maria Carolina's antipathy toward Napoleon never wavered. Parma and the Kingdom of the Two Sicilies suffered greatly (as did the two sisters and their families) from Napoleon's aggrandizment. The lives of the five children dovetail neatly into the development of the Austro-Hungary empire as Napoleon's ambitions wreak havoc with Parma and the Two Sicilies. Apart from Marie Antoinette, I knew very little about Joseph, Leopold, Amalia and Maria Carolina, although I do have Harald Acton's two volumes on the Bourbons of Naples in my library. I do have several quibbles. The book could have used an editor. What happened to the final paragraphs on page 61? A bit of the text is missing. The index is too simplistic, which makes it difficult to look for certain events within the book. IUniverse is a print on demand, self-publisher that offers clients editorial evaluation services. This is not the same as a good editor who actually helps massage a book toward publication. I also wondered why the author neglected to mention that the true reason for Joseph II's visit to Marie Antoinette was to find out why her marriage had not been consummated after nearly six years of marriage. Joseph helped to resolve the issue, and Marie Antoinette became pregnant several months later. The book is available through Amazon and Amazon Kindle. I only hope for Mr. Vovk's sake that he can be signed by a traditional publisher with editors who can turn his prose into a more readable and less confusing text. He certainly has the talent - and an appreciation for history. In Destiny's Hands is available in paperback from Amazon and Barnes & Noble (online) and Kindle and Nook. I have included the links for the US and UK paperback and Kindle editions. Princess Anna Amalia of Brunswick was 19-years-old when she married Constantine, Duke of Saxe-Weimar-Eisenach. Within three years of marriage, Anna Amalia found herself as a widow with two young sons, and becoming regent for her elder son, Duke Karl August. The marriage had been an escape from a mother who never loved her daughter. As she grew up Anna Amalia had embraced books and literature: her love of reading never abated. Being the regent for a small duchy of Saxe-Weimar-Eisenach was not an easy task for a young woman who had not been raised to be a ruler. She had to deal with court officials who railed against her regency. In the 1770s, Saxe-Weimar was a backwater, but Anna Amalia, a cultured, educated woman, was able to establish Weimar as a a cultural center. Weimar's status was greatly enhanced by the arrival of Wolfgang Goethe in 1775, who became a close friend of Duke Karl August. This led to an introduction to Duchess Anna Amalia and her ever-growing literary circle. Anna Amalia's coterie grew in prestige with the support of Goethe and Friederich Schiller. Little Weimar had suddenly become the center for culture and art. She was also a gifted composer and musician. Anna Amalia Grand Duchess Patron of Goethe and Schiller is a modern reprint of a book first published in 1902. The author is Francis Gerard, the nom-de-plume of Geraldine Fitzgerald, an Irish woman who moved in German noble circles. The modern edition may have tightened up some of the 19th century language by editor Alan Sutton, but the story of a royal bluestocking still stuns, more than 200 years after her death. Anna Amalia, who died in 1807, established Weimar as a major cultural center. Her library, now more than 1,000,000 books in Weimar is still extant. Anna Amalia was a truly remarkable woman. She was able to use her gifts and her joy for literature to bring great changes to Weimar. I think she would be a great subject for a movie. Her story should be told. Today's mail brought me several new books (woo hoo.) One book I took the couch (after first going to the gym for my Monday night Zumba class) to examine and read. On October 20, Hereditary Grand Duke Guillaume married Belgian Countess Stephanie de Lannoy. It was a very grand wedding for tiny Luxembourg. 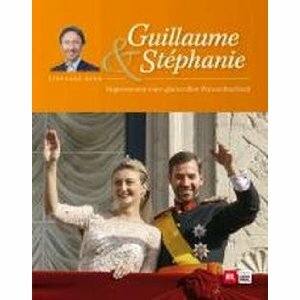 Guillaume was the last European heir apparent to wed.
Editions St. Paul (with the support of Luxemburger Wort, one of the country's primary newspapers) and TV network, RTL) published the two book in two editions: French and German, two of Luxembourg's three languages. I ordered the German edition because I can read the text. From what I understand, apart from the language, there are no differences between the two editions. Stephane Bern offers readers a glimpse into the lives of Guillaume and Stephanie through words and images from their births and baptisms to the announcement of the engagement followed by the civil and religious services. The book also includes the text of the couple's pre-wedding interview, as well as the official photographs for the engagement and the wedding. 112 pages. Hundreds of photos, all in color. The book also features a lovely sketch of the Elie Saab wedding gown and the Lannoy tiara that the bride wore on her wedding day. The couple made their vows in Luxembourgish although most of the wedding was conducted in French. The book comes with a DVD, RTL's coverage of the wedding. This DVD is Region 2 PAL, which means North Americans will not be able to view the DVD unless they have an all-region code free DVD player with a built-in PAL converter. Both editions, as well as an E-book (French), can be ordered directly from Editions St. Paul. Hoogstraten, a bookstore on the Hague, offers the French language edition, and Amazon.de sells the German edition. Guillaume & Stephanie is (as far as I know) the only book on the wedding. It offers a more than adequate look at the wedding -- and the lives of the bride and groom -- but I would have preferred a bigger book with even more wedding photos including more photos of the guests. The book was published in a soft-cover and cost 21 Euros. The E-book is 15 Euros. Thoroughly enjoyed the book. As I turned each page, I was reminded of the actual wedding day when I got up at 4 a.m., turned on the laptop to be able to watch the live streaming. I now plan to watch the DVD from the comfort of my couch -- and at a reasonable hour. Royal Gatherings Who is in the Picture...? is Eurohistory.com's newest book. Art Beeche has delved deep into his private archive, and with the help of Ilana Miller, has produced a book that was inspired by the Who is in the Picture series in his magazine, European History Journal. This is the first volume, and it covers 1859-1914. The 38 chapters included family groups at engagements and weddings, parents with their children, and the final photograph of Archduke Franz Ferdinand and Countess Sophie von Chotek shortly before their assassinations in June 1914. The authors note that these photographs are a "unique record of family life, albeit privileged family life." The family groups include Battenbergs, Greeks, Queen Victoria with her children at Coburg, the Bourbon-Two Sicilies, the Hohenlohe-Langenburgs, the Saxe-Coburg and Gothas, Danes, Spain, Belgium, among others. The images evoke more than the event thanks to the accompanying text written by Ilana Miller and Art Beeche. One can look at the photograph, and become a part of it by reading the story about the people in the photograph. One quibble: the authors should have included a bibliography of source material. 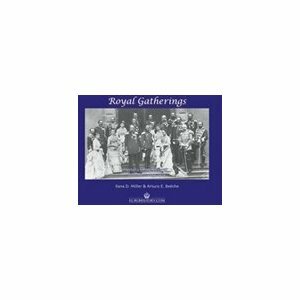 The best way to order Royal Gatherings is through Amazon. I look forward to volume II. Grand Duchess Marie Alexandrovna. Grand Duchess Olga Constantinova. Duchess Marie of Mecklenburg-Schwerin. Princess Dagmar of Denmark. Four different fascinating women. Grand Duchess Maria Alexandrovna was the much loved (and spoiled) daughter of Alexander II who married Queen Victoria's second son, Prince Alfred, Duke of Edinburgh. Grand Duchess Olga was only sixteen-years-old when she married King George I of the Hellenes, who was the younger brother of Princess Dagmar, who was engaged to not one but two heirs apparent. Duchess Marie of Mecklenburg - Miechen - was the wife of Grand Duke Vladimir, younger brother of Alexander III, who was the husband of Princess Dagmar. 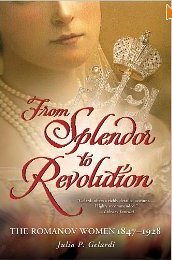 From Splendor to Revolution The Romanov Women 1847 -1928 by Julia P. Gelardi is the story of these four women. And what a story. Or stories. This book is a breakthrough for Gelardi, whose previous books, Born to Rule: Five Reigning Consorts, Granddaughters of Queen Victoria and In Triumph's Wake, Royal Mothers, Tragic Daughters and the Price They Paid for Glory, both of which also dealt with strong and compassionate women. The book flows largely seamlessly as Gelardi tells the stories of these four women. She delves deeply and intensely into English and Russian language sources, and gives readers insight into the lives of the the four grand duchesses. It may have seemed that these women lived four separate lives, as one one was an Empress, another was the Queen Consort of Greece, one was the consort of the Duke of Saxe-Coburg and one was the wife of the brother of the Russian Emperor. Thus, in many ways, in many episodes, the lives of these women were intrinsically linked to Russia. Yes, Marie Alexandrovna, Olga Constantinova, Marie Pavlova and Marie Feodorovna (Dagmar) all believed in their imperial entitlement, but were also women of great faith. Marie Pavlovna remained Lutheran for many years, until she chose to convert to the Orthodox faith. Many believe she did this because of the possibility that the succession would eventually pass to her eldest son, Kirill, but she accepted the faith after she prayed to the Blessed Mother after Kirill was injured during Russo-Japanese War. She also owned an icon of the Virgin Mary even before she converted. But it can be said that Marie Pavlovna and her husband, Grand Duke Vladimir, were openly ambitious in the desire to have the throne. Alexander III did not trust them. Miechen and Empress Marie Feodorovna were the leaders of the society, each championing their own causes. Marie Feodorovna was at the apex because she was the Empress. Miechen could only aspire to what was Marie Feodorovna had by the privilege of her position, first as the wife of the Heir to the Throne, and then as wife of the Emperor. As Queen of the Hellenes, Olga was actively involved in charity work. She butted heads with the Orthodox church when she supported a project to translate the Bible into Greek. She and her husband had a happy marriage, in spite of George's infidelities. Olga was devastated when George was assassinated in 1913. The real revelation is Grand Duchess Marie Alexandrovna. She has always been described as a bitter and insecure woman who never felt welcome at the British court. She was pushy to the extreme, conscious of her position as the daughter of Alexander II. Marie Alexandrovna had better jewels than her English sisters-in-laws. She was also pro-German, and happy to leave England when her husband succeeded as the Duke of Saxe-Coburg and Gotha. But she was also a woman who cared about her family, but was sorely tested by her only son, Alfred. 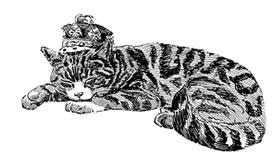 Minnie had the exalted position, as Empress, but after the premature death of her husband in 1894, she could only watch with sadness -- and eventually horror -- as her eldest son, Nicholas II, dominated by his social misfit consort, Alexandra -- gambled away Imperial Russia. All four women suffered through tragedy, privations, and exile. Minnie never accepted that her sons, daughter-in-law and five grandchildren were murdered by the Bolsheviks. Queen Olga was in Russia when the Revolution broke out, but eventually was able to make her way to Greece, only to watch the Greek monarchy collapse, and the Greek royal family sent into exile. All four women survived the revolution. Marie Alexandrovna was living in Germany, as the widow of a German duke. Her support of Germany was a disappointment to her eldest daughter, Queen Marie of Romania. With the support of others, including the British government, Minnie, Miechen and Olga were able to leave Russia. Deprivation and stress led to Miechen's health suffering greatly in the final months of her life in Russia. The revolution meant the end of the splendor, the magnificent jewels, the palaces, the flunkies meeting all their needs. It also meant the end of the appanages, leaving the women largely dependent on relatives. Not only did Marie Alexandrovna lose her Russian sinecure, she was living in Germany, where the monarchies fell like dominoes during the final days of World War I. The only real income that Marie Alexandrovna could depend on was the £3000 annual payment from Great Britain. This payment was included in the treaty between Britain and Russia at the time of her marriage to the Duke of Edinburgh, The payments began in 1900 following her husband's death, and continued until her death in 1920. Splendor to Revolution is a terrific book, footnoted to the gills, which is wonderful. A definite keeper! I think the book would make a great mini-series as it reminds me of the wonderful Fall of Eagles, an excellent book, and an even better dramatic series. I am looking to reading more about the upcoming BBC adaptation of Philippa Gregory's The White Queen, a historical novel about Elizabeth Woodville, consort of Edward VI. One would assume that the series would be bought by PBS or BBC America, but it looks like the series will be shown on Starz, a premium cable channel. I would hazard a guess and say that Starz is one of the producers.